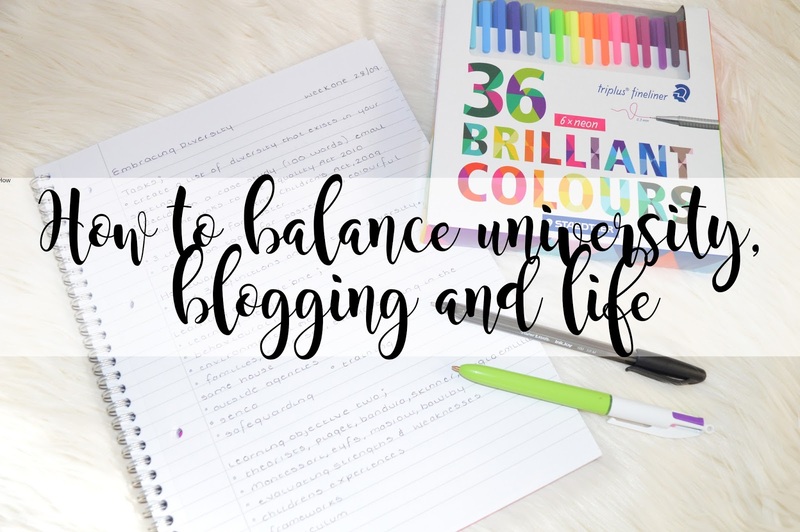 So recently I asked on Twitter if anyone had any topics which they'd like me to write about on my blog and one came up so many times on how I balance University, Blogging and my general life and I really thought this was a good idea! I am a second year student at University, I am currently blogging every single day while also having a part time job, a boyfriend who works 40 hours a week and being very close to my mum, I like to spend time with her too. However, I still some how manage to fit everything into my week, every week and I'm going to share my tips with you on how I do this! First things first, I have three diaries and they make my life so much easier! I use one for university where I have wrote down whenever I have a half term or a day where I do not need to go into University, as well as writing down all of my deadlines etc. On each day I go into university, I write down any homework which we're set and when it's due, and then I'll write on the due date the homework which was set too! In my university diary I have also wrote down my half terms for my job, as working in a school the half term dates can quite often fall on a different week to my half term at university. My second diary is used for general life, I write down what days I am at work, my half terms at work, as well as teacher training days. As well as this, I also include the shifts my boyfriend works on each day so I know what time he's home each day and what days I am able to see him when he's not working on the late shift. Obviously I also include all of the important information such as birthdays, important dates, anniversaries etc into my diary just so I don't forget! Thirdly, if you have seen my "Queen Bee" diary, you'll know this is for blogging! In the front of my diary this is a small calendar for every month of the 2016/2017 academic year which includes tiny little squares. I use this section to colour code my blog topics and then to schedule a post to each day based on the topics and which topic I haven't spoken about much on my blog recently. It's a way of spacing out the topics on my blog across the month and ensuring I always speak about each of them throughout a week or fortnight. On each day of my planner I also use the same colour to write in what post I am scheduling on each day so I can look back at it and see what I have published. I go to University on a Wednesday from 10am-3pm and I work on Thursdays and Fridays from 8:30am-3:30pm. This means I have from 3:30pm onwards on Wednesdays, Thursdays and Fridays to either blog or do some Uni work. In this time, I do like to try and do a bit of both! Why not try and hit two birds with one stone? I then have the weekends and Mondays and Tuesdays to do absolutely nothing which means a spare 4 days to either blog, crack on with uni work or spend time with my mum or boyfriend. My boyfriend usually has a Sunday off work meaning I spend this day with him, whether we go out or stay at home! I sometimes also spend some of this time with him either blogging or University (like today, I have spent all day with him but also spent hour working on my uni projects and blogging and sometimes he doesn't mind this). I usually try and spend half a day doing parts of my University projects, and then the other half of the day blogging. I'll do this on two of my spare days during the week. This then leaves a day to spend with my boyfriend and a day to spend with my mum. However, the day spent with my mum is usually spent baking! This isn't always my routine but I do find it makes me happy, and I very rarely feel stressed about having no time, when I clearly have too much time even though I work, blog and study! I have to say, the main part of balancing three or more different aspects of life is to be organised and I cannot stress this enough. I am a very organised person and I like to have a plan for each day! If you do not have a diary, I highly suggest buying one, they are the best thing for being a student and a blogger! I hope this has helped someone out there who is struggling to balance their life and all of their commitments! Balancing everything is something I definitely struggle with! I can feel my blog going on the back burner and we are only into the second month! I definitely need to get more organised when it comes I doing everything!